Doubts about US/Chinese trade cease-fire continue although mood at least stabilizes -- The market mood stabilized somewhat on Wednesday about the US/Chinese trade deal after China's Ministry of Commerce issued a statement saying that the meeting with the U.S. was "very successful" and that China will quickly implement the trade agreement. The Chinese statement acknowledged the 90-day deadline and said that preparations are being made to buy more U.S. agricultural, energy and industrial products. It remains unclear whether China will drop some of its retaliatory tariffs to remove a big impediment to higher Chinese purchases of U.S. products. Chinese President Xi will return to China today after stopping in Europe on his way home from Saturday's G-20 meeting. 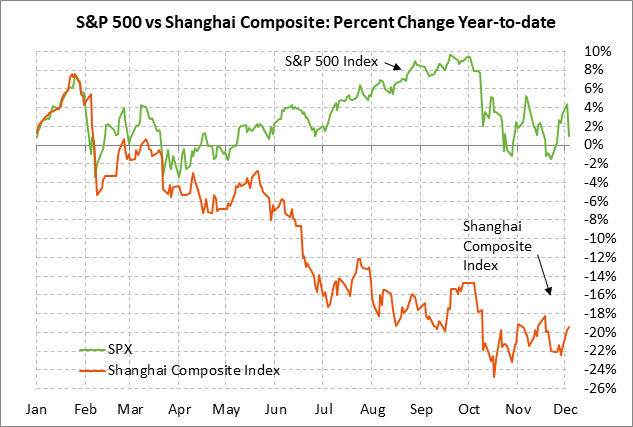 After getting more guidance from President Xi and his top aides upon their return, the markets are hoping that China's various government officials will be able to start executing on whatever China promised to do at Saturday's meeting. Inversion of 3s5s Treasury curve spooks stock market -- Tuesday's sharp -3.24% sell-off in the S&P 500 index was due in part to increased concern about an inverted yield curve. The Treasury 3s5s spread turned negative on Monday and the 2s10s spread on Tuesday fell to a new 11-1/2 year low of 12 bp, the flattest level since June 2007. An inverted yield curve is usually the result of short-term yields rising faster than long-term yields. 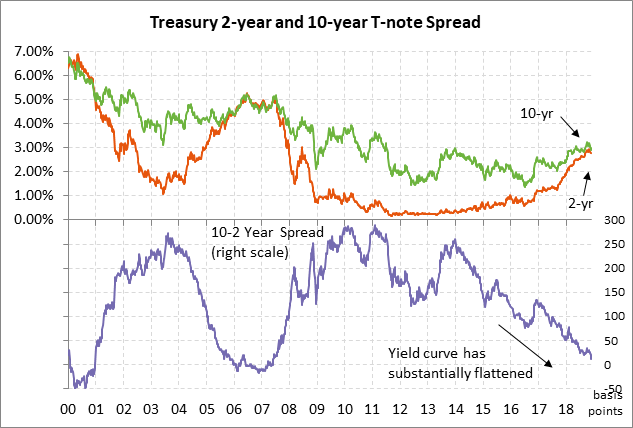 In this week's case, however, the flatter yield curve has been due to the bullish case of long-term yields falling faster than short-term yields. Longer-term Treasury yields fell early this week on (1) safe-haven demand tied to Tuesday's plunge in stocks, and (2) reduced inflation concerns after the Nov ISM prices-paid sub-index on Monday plunged by -10.9 points to a 17-month low of 60.7 and Fed Vice Chair Clarida said that the Fed is more worried about inflation falling short of its 2% target than running above it. The stock market in any case took the flatter yield curve to mean there is an increased chance of a recession. Regarding short-term rates, the market is discounting a 100% chance of a +25 bp rate hike to 2.25%/2.50% at the next FOMC meeting in two weeks on Dec 18-19. The market is expecting a smaller +20 bp hike in the IOER (interest on excess reserves) rate to 2.40%. The funds rate has recently been trading right at the current IOER rate of 2.20%, which acts as a ceiling on the funds rate. Last week's minutes from the Nov 7-8 FOMC meeting essentially came right out and said that the FOMC will increase the IOER rate by only +20 bp with its next rate move, rather than a typical +25 bp move, because that would help the funds rate target trade closer to the mid-point of the funds rate target. The January 2019 federal funds futures contract is currently trading at 2.40%. That shows that the market is discounting a 100% chance of a +20 bp hike in the IOER rate to 2.40% at the Dec 18-19 FOMC meeting, along with a +25 bp hike in the funds rate target to 2.25%/2.50%. The January federal funds futures contract better reflects expectations for the Dec 18-19 meeting since the December futures contract will only be trading at the new rate for the second half of December, not for a full month, as will the January futures contract. OPEC+ expected to cut production by about 1.1 million bpd -- The market consensus is for OPEC+ at its meetings today and tomorrow to implement a 2019 production cut agreement of 1.1 million bpd, according to the median estimate of a recent survey of oil analysts by Bloomberg. Saudi Oil Minister Al-Falih said last month that OPEC+ should consider a production cut of about 1 million, which is less than forecasts that a 1.3 million bpd cut would be necessary to fully offset the expected oil surplus in 2019. 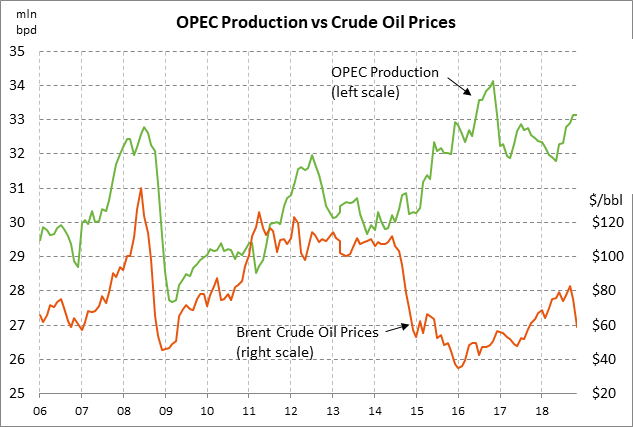 Russia is dragging its feet in negotiations for a production cut, which means that an OPEC+ production cut may turn out to be on the lower end of expectations. A production cut of much less than 1 million bpd could result in a significant drop in oil prices. 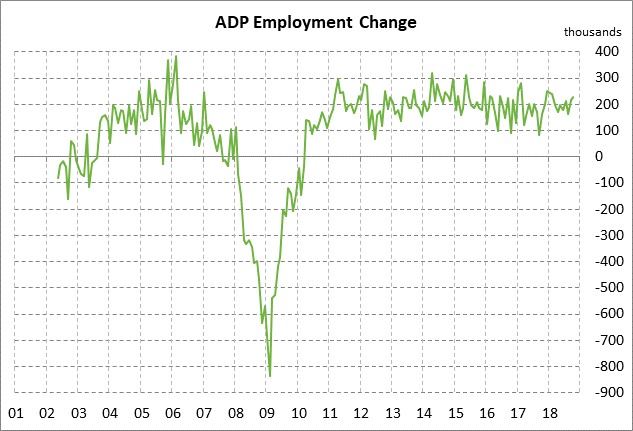 U.S. ADP employment expected to show another solid increase -- The market consensus is for today's Nov ADP employment report to show an increase of +195,000, down from Oct's strong report of +227,000 but very close to the 12-month trend average of +196,000. Friday's payroll report is expected to show a similar increase of +200,000, which would illustrate continued strength in the U.S. labor market. U.S. ISM non-manufacturing index expected to remain strong despite another decline -- The consensus is for today's Nov ISM non-manufacturing index to show a -1.3 point decline to 59.0, adding to Oct's decline of -1.3 to 60.3. Despite expectations for a back-to-back decline, the index is expected to remain strong at 59.0, illustrating continued confidence in the non-manufacturing sectors of the U.S. economy as GDP growth continues to run well above normal. 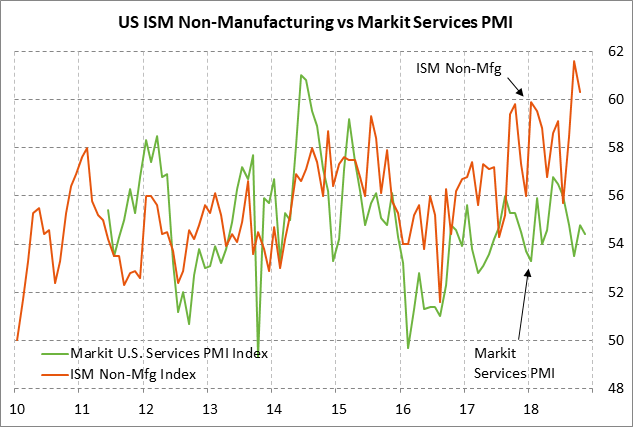 Today's final-Nov Markit US services PMI is expected to be unrevised at 54.4, leaving the index down by -0.4 points from October. The Nov manufacturing PMI released earlier this week unexpectedly rose +1.6 points to 59.3. U.S. trade deficit expected to widen to 10-yr high -- Today's Oct trade deficit is expected to widen to -$55.0 billion from Sep's -$54.0 billion, thus pushing the deficit to the widest level in level in nearly 10 years. 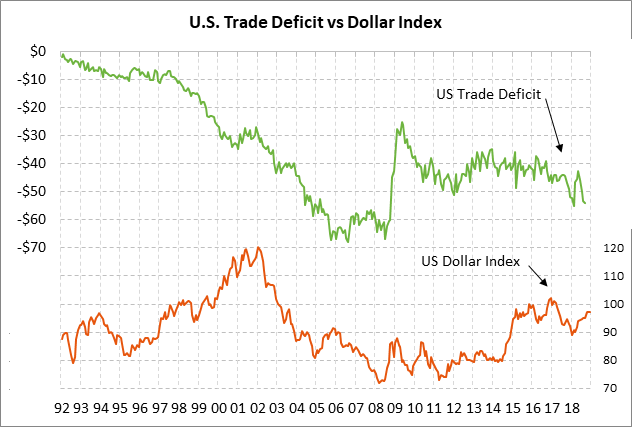 The U.S. trade deficit is currently being buffeted by volatile trade flows on attempts by various players to beat any new U.S. and retaliatory tariffs.